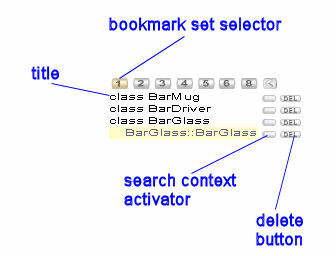 Advanced Bookmark Creation within Depeche View. How to create remarks with self-defined text to structure your bookmarks by headlines, and how to store search contexts with bookmarks. If you have many bookmarks, you may want to arrange them in blocks, with blank lines inbetween, or with remark headlines. -  press CTRL+R. A dialogue pops up, and you can enter the remark text. 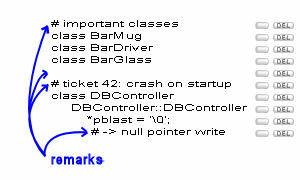 To create an empty remark line (spacer) anytime, press CTRL+SHIFT+R. To change the text of a bookmark remark, double click on it. - click on the little box left to "DEL", right beside the bookmark. with your original search expression. Instead on just clicking a bookmark, you may hold SHIFT and then click on it. In that case, the path of this text location is filled in automatically into the path mask (independently from any search context use). Click on "..." and then on "copybm". The bookmark set is now within your clipboard in a plain text form, suitable for emailing, or for editing in a text editor. When finished with editing, mark the whole bookmark text, copy it to the clipboard again, then enter Depeche View and press SHIFT+INSERT. The existing bookmarks are all replaced by those from the clipboard. NOTE: search contexts cannot be exported, and are lost on import! Whenever you type something into the find or path mask, the bookmarks are searched FIRST if their content may match. If so, the matching bookmarks are highlighted. - move the mouse into the bookmark area, to delay automatic search while typing. - then type, for example, "class". -> all bookmarks having "class" in their bookmark title, or in their full bookmark line (remembered internally) will be highlighted. 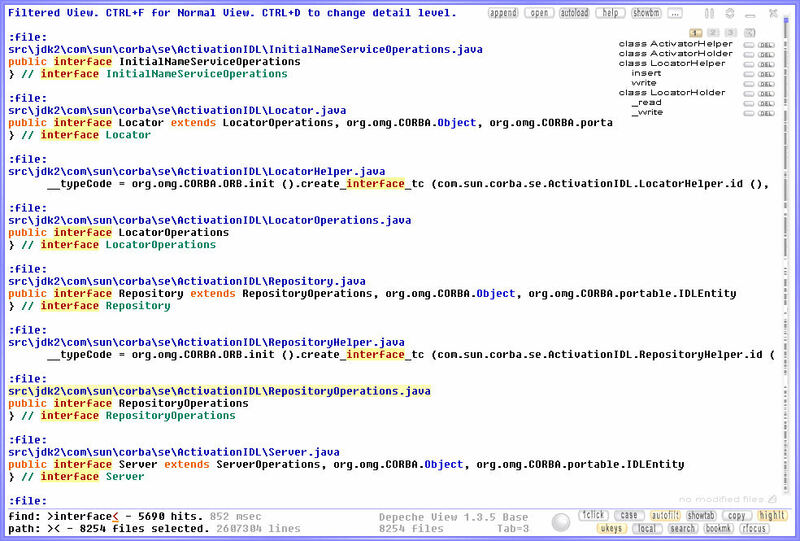 -> all bookmarks with a location in a .cpp file will be highlighted. - after several seconds, dview will run a search for what you typed; if you're interested just in the bookmarks, ignore that. but if NO bookmark is highlighted, your search term didn't match any bookmark - so you were about to run a normal search, anyway. Next chapter: Defining A Workspace. Depeche View is a high speed text search tool for Windows and Linux (WINE). Download the free Lite Edition here, or the 30 days Pro Demo here. Depeche View Lite requires no installation. Just run the tool, then load and search all text files of a folder instantly in one window. snapshot with 8254 files loaded. the word "interface" was found 5690 times.